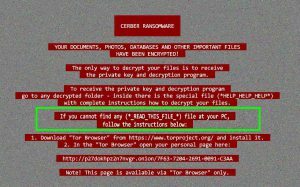 CERBER ransomware has been reported by security researchers to now be able to perform evasion of security software by using new obfuscation technique. 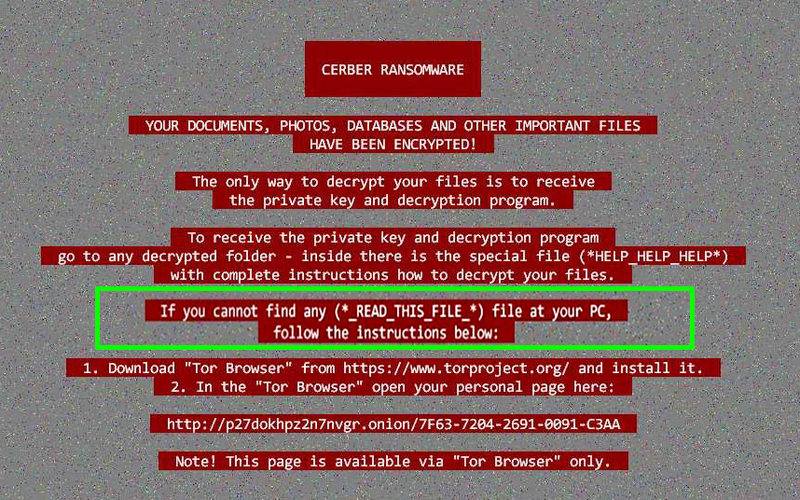 Since most security software have machine learning features which block loaders of viruses, like Cerber, the ransomware uses a new tool that evades this. The obfuscation tool is actually a script that injects code in legitimate processes that are white listed by security programs and via those regular processes, the malicious CERBER code is activated. The distribution tricks and how CERBER is slithered has not changed much and the same old e-mail spam messages are used. These spammed emails contain a very specific .exe file, though – an SFX (Self Extracting Archive). These type of files extract the malicious executable of CERBER ransomware which is automatically executed. This executable then uses the legitimate process rundll32.exe to run a .dll file without being detected. This action results in running a binary, after which running another executable via this binary which contains CERBER ransomware in it. The interesting part is the loader itself is contained in CERBER ransomware’s binary and it is more complicated than initially supposed. The loader is configured to detect virtual drives or the following antivirus programs or software. In the even that these programs are activated onto the computer of the victim, the virus immediately ceases running. According to Trend Micro researchers, the separate loader, dropped after executing the script from the Rundll32.exe file is dropped primarily because of the machine learning features of most modern anti-malware products. These very extras can detect malicious files not based on their unique SHA or MD5 hashes and signatures but instead using the activity and the code on the files themselves. This separate loading of files by taking advantage of legitimate process can make behavioral blocking of the threat significantly more difficult for machine learning algorithms. Another difficulty also employed is the type of executables being used – SFX. These self-extracting archives can make the process even more difficult because the files themselves are not illegitimate and can be created by programs, like RARLab, WinRar and others with different signatures every time. And the fact that the activity of those files is the same, means that the machine detects the same behavior of the executable sfx executable file, which it deems legitimate, making it more difficult for the ransomware authors. Despite this happening, it can still be prevented, if you, the user, have the adequate anti-malware protection and in addition to this have the means of protecting yourself from malicious archives sent in spam e-mails, like the sfx ones. Threats such as CERBER may be persistent. They tend to re-appear if not fully deleted. A malware removal tool like Combo Cleaner will help you to remove malicious programs, saving you the time and the struggle of tracking down numerous malicious files. Threats such as CERBER may be persistent on your system. They tend to re-appear if not fully deleted. A malware removal tool like SpyHunter will help you to remove malicious programs, saving you the time and the struggle of tracking down numerous malicious files. Note! Your computer system may be affected by CERBER and other threats. SpyHunter is a powerful malware removal tool designed to help users with in-depth system security analysis, detection and removal of threats such as CERBER. 2. Scan with SpyHunter, Detect and Remove CERBER. Ransomware infections and CERBER aim to encrypt your files using an encryption algorithm which may be very difficult to decrypt. This is why we have suggested several alternative methods that may help you go around direct decryption and try to restore your files. Bear in mind that these methods may not be 100% effective but may also help you a little or a lot in different situations. Note! Your computer system may be affected by CERBER or other threats. Fix registry entries created by CERBER on your PC. Combo Cleaner is a powerful malware removal tool designed to help users with in-depth system security analysis, detection and removal of threats such as CERBER. Step 5: In the Applications menu, look for any suspicious app or an app with a name, similar or identical to CERBER. If you find it, right-click on the app and select “Move to Trash”. Step 6: Select Accounts, after which click on the Login Items preference. Your Mac will then show you a list of items that start automatically when you log in. Look for any suspicious apps identical or similar to CERBER. Check the app you want to stop from running automatically and then select on the Minus (“–“) icon to hide it. A pop-up window will appear asking for confirmation to uninstall the extension. Select ‘Uninstall’ again, and the CERBER will be removed. When you are facing problems on your Mac as a result of unwanted scripts and programs such as CERBER, the recommended way of eliminating the threat is by using an anti-malware program. Combo Cleaner offers advanced security features along with other modules that will improve your Mac’s security and protect it in the future. Hey !, I found this information for you: "CERBER Ransomware’s Distribution Updated (March 2017)". Here is the website link: https://sensorstechforum.com/cerber-ransomwares-distribution-updated-march-2017/. Thank you.